Back in the 1960s, when the music now commonly known as fusion was called "jazz-rock," the earliest bands to get plastered with said label were essentially funk and rock rhythm sectionsguitar, bass, keys and drums, plus or minus congaswith a lead singer and a jazzy horn section tacked on. Think Blood Sweat and Tears, or Tower of Power, or any number of the dozens of less-familiar bands in the sub-sub-genre such as Ten Wheel Drive (with Dave Liebman), Osmosis (with Charlie Mariano), Azteca (with Lenny White and Pete Escovedo), and Dreams (with the Brecker Brothers, Billy Cobham and John Abercrombie). These bands either went totally commercial or broke up entirely. Jazz-rock bands with horn sections were quickly eclipsed by smaller units, such as Weather Report and the Mahavishnu Orchestra, that had a completely different take on jazz-rock. A few brave souls continued to work in the horn-section milieu: most notably ex-Dreams and ex-Mahavishnu drummer Billy Cobham, who produced a number of remarkably fine recordings with an eight-or nine-member band during the mid-to-late 1970s. The band Matrix, briefly signed to RCA and Warner Brothers, also had a good run around the same time. Michael Vlatkovich has done some remarkable music in this vein, as well. But, for the most part, jazz-rock bands with horn sections weren't happening for quite some time, unless you count The Saturday Night Live Band. As with all things stylistic the "horn band" genre has come and gone a few times, and may now be experiencing a mini-resurgence. The most remarkable development has been the across-the-board success of Snarky Puppy, who now boast a Grammy award, among other accolades. While we're all holding our collective breaths, awaiting the flood of Snarky Puppy sound-alikes to tumble down the pike, here comes this young and erudite trumpeter / composer John Blevins with an octet of upstarts called Matterhorn. Their eponymous debut album, released on the California-based pfMENTUM label, bears just a passing resemblance to Snarky Puppy's highly-produced funky jams. The instrumentation is similar, but the result is different: Blevins' musicthough expertly playedis rawer and less slick. It's tempting to say that Matterhorn is "more jazz based" or "sounds more avant-garde," but that would be missing the point. This is adventurous, risky music, but not at all unpleasant or self-conscious. Blevins has crafted eight complex compositions for his excellent band, who, like their leader, can play really effectively in a number of genres. Blevins, himself, has worked with IconIQ: The Soundtrack Orchestra, folk-rockers MegaFauna and Morningsiders, and contemporary classical composer Brooks Fredrickson, in addition to the usual jazz, funk, and jazz-funk bands that populate New York's underground music scene. 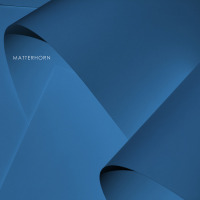 Matterhorn freely takes in all of these musical experiences, refracting it through a decidedly modern jazz-based point of view. The result is cogent, beautifully realizedboth compositionally and in its executionand a joy to listen to. The band uses electronics extremely well. There's lots of wonderful Rhodes piano, and some fine electric guitar, and all of the horn soloists seem to be able to switch something or other on at various times to change up their sound. But electronics are clearly not the focus of Matterhorn. Track Listing: Identity Theft; Unaware; Brink; Nascent; Little Dickens; See; Breathe; Hear; See (alternate take). Personnel: John Blevins: Trumpet; Drew Williams: Tenor Saxophone; Brad Mulholland: Alto Saxophone, Flute, Clarinet; Nick Grinder: Trombone; Marta Sanchez: Fender Rhodes; Jeff McLaughlin: Guitar; Marty Kenney: Bass; Nathan Ellman-Bell: Drums, Percussion; John Doing: Congas.